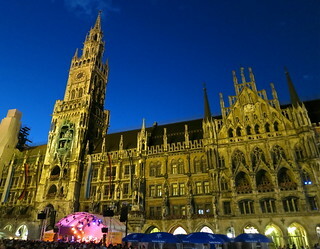 Walking around Munich at night, I was suprised at the familiarity. My last visit was 27 years ago, when my Dad brought me on a father-son trip through Germany. Happy Father's Day! I had my first German beer at the nearby Hofbräuhaus, and they are going nuts there tonight as Germany just beat Denmark in the Euro Cup.